This Kindle 3 vs Sony PRS-650 review outlines all the differences between two of the most popular ebook readers on the market. 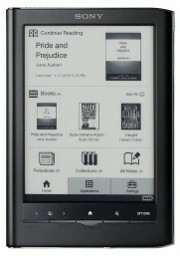 Trying to decide between getting a Kindle 3 or Sony PRS-650 is not an easy task (I’m glad I don’t have to choose). Hopefully this post can help you make the right choice for your specific ereading needs. You can visit each of these ereader’s main review pages to learn more about them and to see video reviews and PDF reviews. Here’s the links to the Kindle 3 review and the Sony PRS-650 review. Active hyperlinks for PDF files. Choosing between buying the Kindle 3 and Sony PRS-650 is not easy, but the good news is that you can’t really go wrong with either if you are looking for a good quality ebook reader that is easy to use and get ebooks for. 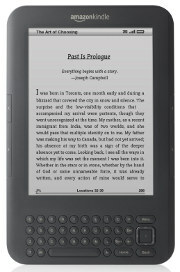 Both are made by two of the founders in the ebook reader field, and both are polished ereaders, each with its own unique set of advantages and disadvantages. For most people, it all comes down to wireless and EPUB support. Which is more important to you? Too bad we can’t merge the two devices together to get the best of both worlds. Which is more likely to be functionally enhanced through future firmware upgrades? Will have to think about this some more and watch all your videos again. Leaning towards the Kindle because of the price and all the free books. How long do you think it`ll be before this device shows up? The Kindle is probably more likely to get more firmware updates/upgrades, but you never know. Especially considering the fact the Kindle is getting apps. J.M., I doubt that will be happening anytime soon. In truth, I wouldn’t be all that surprised if the Kindle got support for DRM free ePub ebooks somewhere down the line, perhaps via an app, but I don’t think Amazon and Adobe will ever collaborate to give the Kindle Adobe DRM support—Amazon would have to concede to Adobe. It’s like the VHS and Beta war—how’s that for a dated reference? I just saw a video the other day(think it was on Len Edgerly`s blog) showing a Library that was lending out Kindles. I thought how strange since you can`t borrow library books with the device. I wonder if Amazon is contemplating some deal to allow their format to be available in Librairies? Not sure if that`s even possible but I really thought that video was odd. When you add additional fonts using the information you provided are you adding them to the Reader itself(therefore available for all non DRM books or are you just adding them to a particular book? That may be a stupid question but not presently having a reader I can`t try it out. When adding fonts, you put whatever fonts you want in a folder on the Reader (it’s not really a hack), and then add a bit of CSS code to the ebook so that it knows to retrieve those fonts from the folder. With Calibre you can mass convert all your ebooks at once with the new CSS code if you find a particular font that you want across all your DRM-free ebooks (I’m still searching for the perfect font; I’m liking Calibri at the moment, but it could be better). Regarding library ebooks and the Kindle, that’s something that could happen pretty easily if Amazon really started pushing for it. A few libraries have ebooks in Mobi format, and Amazon’s format is based on that format, not to mention the fact that Amazon now owns Mobipocket. Thanks for the font explanation. That would be great if Amazon would support Library access. This comparison is full of awesome. I wish I could find a comparison like this whenever I´m trying to decide between 2 products. As you say the ideal ebook reader would be a combination of both- which I think will happen with the next model after they see what the other one has done! I will therefore buy the Kindle WIFI now and save the rest of the money for the next model. I am sure I could donate this model to a library or a charity in a year or so. £200 is too much for the Sony, I can convert ePub books to Kindle with Calibre, and I have Internet access with my iPhone. A question about the Kindle. or can you download any file to a computer via the USB cable using the Kindle 3G and it`s Browser if you don`t have Internet access at home? For example could you go to a site and download the latest update file for a program that you might have on your PC/Mac? Just books in AZW, MOBI, PRC, and TXT files. And only if they don’t open in a new window. Did you happen to get the lighted cover with either your Kindle or Sony? If so what do you think of them? Nope. I’ve heard good things about the new Kindle 3 lighted covers, they’ve got a 4.5 star rating over 602 reviews, but I’m of the opinion that they are way overpriced at $59.99. I’ve just been using the Beam and Read lights that I reviewed earlier in the week for reading at night. Another question if you don`t mind. In the PRS 650 Review you have a section on things that need to be improved such as styling options etc,are those improvements that can easily be done by Sony with a simple firmware update for this model or is it more complicated than that? If it`s a firmware update, is Sony known for paying attention to feedback and making improvements on existing models via firmware? If history is any indication, Sony’s not much for firmware updates. People have been using that same method for changing fonts on the older models from a few years back. Sony needs to pay attention to Reviews and the feedback from people. Thanks for all your hard work and answering all my questions. I went to a bestbuy in my area, and they only had older Sony models on display ( prs 300/600 )Is the 650’s font sizes similar to the 600? any changes? Yeah there’s some different font sizes but overall they are pretty similar. No dictionary with the browser. also with the k3, can you use the dictionary when reading articles on the web via the dpad scheme? ah, yeah medium felt too large, and small too small 🙁 at best buy i used the 600’s zoom feature with the font set at small and the text seemed to fit perfectly on to the page. If I did this with the 650, and used zoom locked, would it act strange at all? If you live in the USA, the decision is quite difficult. However, for those people living North of the border in Canada, the decision comes down as to whether you want to read new and current books. The majority of EPUB books sold by the eBook store are unavailable in Canada due to publishers distribution copyright problems. Amazon basically has sewn this problem up and one can download almost anything from their site and the prices are very good when compared to purchasing in Europe or the eBook store. You can also convert your EPUB format to the Kindle format but not often the reverse. This was the clincher for me, apart from the wi-fi. Hi there,great to find a comparison site as i am very close to buying kindle but biggest question i have is…the advertising says 3g will work in australia but will it? have never purchased from overseas before, just want to be reassured before handing over $ if it won’t work like i want! thanks and keep up the great discussion! It looks like the 3G coverage works in parts of Australia. You can click the wireless coverage map on the Kindle International page to see the coverage area. Your were asnwering J.M’s question about lighting “I’ve just been using the Beam and Read lights that I reviewed earlier in the week for reading at night.” does this mean there is no back lighting???? That is correct. No back-lighting. Epaper is designed to look like ink on paper. Does the new Sony have a removable memory card? I know the last one didn’t. The 650 has an SD card slot and Pro duo card slot. Internal is 2GB and is not an sd card, if that’s what you mean. I had question, right now I am in middle to choosing two device you mention. I am live at indonesia, which give me no opportunity to buy book from amazon nor sony. so the online option maybe is not big difference for me. I need to used my ebook reader for read, medical journal, and some medical text books, mostly they used pdf format. with locked zoom feature maybe I will choose for sony, since many journal will had 2 columns. I knew if amazon will convert pdf to kindle format for free, if I send my journal in pdf format of course, would they do it for me, or I must convert it’s my self? and that make me think again about kindle, they had limited format they can used than sony. and the other thing I like on sony, the sony can search word within scan pdf, I don’t know this will works on 650 but on your 950 review it can do it. but sometimes I like to read manga, after few reseacrh on google, it’s seem both had “way” to do it. I will buy this via ebay. so if you are me, which one I will buy? Alien, for PDFs the Sonys are a little better than the Kindle 3 but not by much. The conversion is free as long as you don’t have it delivered via 3G to the Kindle. Conversion works best for text based files; it does odd things to complex PDFs with graphs, tables, images, etc. Overall, PDF support is iffy on devices with such small screens and may not be a pleasant reading experience. I’ve one question for you, that is, I have all my books collection in either originally in PDF or converted to PDF. These are technical documents for IT study etc..
Will kindle do better in my case? PDFs are a tricky issue, too many variables. Margins. Font size. Document size, etc. If you’ve got a sample I could test it. Does the PDF 2 column mode work as smoothly as it did in your video? It looks like you could set mode, set the column width, and just read. I’m read a lot of academic papers so this is a common format for me. This looks a lot better than the Kindle PDF support but any advice would be welcome. The 2 and 3 column modes work well. I just wish they had a preset like those that scrolled left to right too. The Kindle pretty much has the same setting with the Zoom box to that effect, but yes, the Sonys have slightly better PDF support. I give the 650 an A+ for “reading experience” for novels or other text-heavy ebooks. I give the 650 an A+ for saving lots of money in accessing free books. I give the 650 an A for long battery life. I give the 650 (and probably other similarly sized eBook readers too) a D- for reading books containing a lot of maps, photos, diagrams, tables, footnotes, etc. I bought my SRS-650 a month or so ago when I saw the $50 gift card offer. I was waiting for the 650 to show up in retail stores but the $50 discount pushed me to buy directly from Sony. (1) It seemed I’d be able to save a lot of money (getting free classic books from Project Gutenberg, free books from public library, or at a $10 discount over new hardbacks). This has proven to be true. I’ve already read several free books from Gutenberg (www.gutenberg.org) and the supply is endless. I haven’t bought any eBooks yet (other than the lord of ring series and steinbeck collection to use my $50 gift card). (2) I have poor eyesight and the adjustable font size appealed to me. WOW!!! It is very easy to read on the Sony. In addition to the large font size, simply being a flat reading surface eliminates the shadows you get with real book. Also, the Sony stays open when laying on a table so it is very easy to read hands-free (while eating, poor manners, I know, sorry). 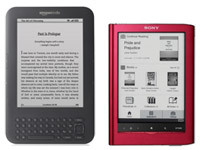 Regarding Sony vs Kindle or Nook (or IPad thingy). I deliberately picked the Sony because it did NOT have internet access. I DO NOT want to be distracted while reading. I have enough ways of accessing the internet – I DO NOT NEED OR WANT another one. Reading is my ESCAPE from technology. Reading on the the 650 is just like reading a a real book. The device ‘disappears’ once you start to read. Unlike my MP3 player which I update weekly for podcasts, once I load up my 650 with a dozen books – why do I need to access the internet wirelessly? Huh? I also picked the 650 because of its touchscreen interface. I love it. At my local Best Buy I tested the Nook and I thought the Nook interface was very confusing. Maybe I’m dense but I was completely confused by its two-screen approach (big eInk screen for reading and little color screen for some navigation.) I played with the Kindle (it was not a live unit) and it felt very cheap and I didn’t care for the internet access. So I opted for the Sony touchscreen (at a premium price) over the Kindle. Overall I like the Sony interface – my one big complaint is the absence of a direct ‘back-up’ button when you are accessing footnotes or some other part of the book. You can use the ‘history’ feature. But I would think that if you access a footnote by taping on the footnote number, you should be able to return the original paragraph by tapping on the footnote number again. That needs to be fixed. I also like the size of the 650. It is light weight, easy to hold and easy to turn pages by swiping finger or pushing the buttons. It is small enough to easily fit in the inside pocket of a jacket. It also fits (I better be careful though) in the back pocket of my jeans. I did not seriously consider the IPad because of its large size, high cost, and shorter battery life. Though it is a beautiful thingy). I’ve been using the Calibre program to manage my eBooks rather than the default Sony application. Calibre allows you to convert eBook formats and manage lots of tasks regardless of the source of the eBook. Sony (like Apple’s ITunes) trys to force you to use their software. So Calibre is a great escape plan from Sony’s universe. I bought the device – I didn’t want to get married to Sony (or to Apple). Overall, I am very happy with my selection of the 650 over other available eReaders. I think the 650’s ‘reading experience’ is excellent for reading novels or other books that are nearly 100% text. I think the 650’s ‘reading experience’ is very poor for reading books that have a significant amount of pictures, maps, tables, figures, etc. It is just very clumsy to navigate back and forth. And the screen is not large enough to handle many pictures or maps. I bought myself a Sony PRS-650 Touch 6 weeks ago and have been using it on a daily basis since then. I’m not the easiest to please but I have to say that I am absolutely delighted with it. The device itself is beautifully manufactured, easy to use and the readability is superb. I did quite a bit of research before buying and the main negative I found was that it does not have wireless connection to the Internet. As strange as it may sound, I actually like that fact. When I pick up the device, I want to read a book, not browse the Web or shop for new books. The only other negative was the price. Maybe it is a bit overpriced but that was only an issue on one occasion: when I handed over my hard earned cash – it hasn’t crossed my mind since. And finally (sorry for being long-winded)it has one outstanding feature that I found in no other e-reader: various dictionaries which allow me to read books in different languages. Double-click on a word you aren’t sure about and the translation appears at the bottom of the screen. If you read foreign literature then this has to be the best device on the market. I’ve been trying to get a hold of one of the PRS-650 since late December. No luck except at Amazon, but its way too pricey, even before shipping to Australia. BUT I found this funny site that sells them at the same price as the Sony stores for $299, and $230 in USA. Supposedly you can get it cheaper, but I didn’t bother with that. But it’s on its way in a few days 🙂 The site is “my” website link if you are looking for one. I have purchased 2 Sony 650’s over the last few weeks…I love them! Bought one for my Mom, liked it so much bought one for myself. I gave my Kindle to my young nephew….haven’t missed it one bit. When I started looking for this device, I also did extensive searches on the web to locate one, I just ended up purchasing from the Sony website. I had to pay tax but shipping is free; for one I even got free engraving from a special they were running. Seems they are the only ones that have them for sale right now at the $229.00 price. I couldn’t be happier. These are both very capable readers, but the Kindle 3 will always win because it’s over $100 less than the PRS-650. When you factor in the cost, the PRS 650 is really poor value for money compared to the Kindle 3. Hallo, thanks for the review. I would like to know if it’s possible with one of the devices, to connect an external keyboard with the aim to write own documents. I need a device to read and to write without stress my eyes too much. I don’t think there are any E Ink ereaders with that capability yet. PocketBook were supposed to add a writing program to use with a Bluetooth keyboard but I don’t think that ever materialized. Pixel Qi screens as you mention are an option but they are best outdoors because they need light to illuminate the screen enough to see. Indoors with the backlight off they are difficult to see without a light on the screen but it’s doable. If someone else is interested. the recent alpha FW of Pocketbook pro support now bluetooth keyboards, so its easier to add and write notes to highlighted text, some members of mobileread mentioned it works well. pocketbook are focused now to optimize the text highlighting and handwriting remarks. If afterwards the official SDK will published, it just a question of time if pocketbook or a free software-developer recompile a nice linux writing application for the pro-models and adapt the bluetooth keyboard feature in it. combined with the other pro-features dictionaries, texttospeech could a nice enrichment of possibilities. Add a spelling dictionary and u got a writing app fulfill my needs. What would you recommend, just for reading? At this point I’d recommend the Kindle 3 because Amazon makes reading easier with the WiFi and built in store and the fact that the PRS-650 is becoming hard to find again. Just excellent and practical comparision, Thanks. 1) Dose Sony PRS-650 support viewing Chinese Characters in novel texts? Thank you very much for your helpful advice ! I’m really not sure about #1, I think it depends on different factors, as long they are embedded it should work. Now #2 is a tough one. That’s a really good price, even for a refurb. But the PRS-T1 has some nice new features. The new fonts are really nice, so is the direct library downloads, and the Wi-Fi is good for getting ebooks and using the browser, which can download ebooks too, even from Kobo, as I just found out. The main advantages the 650 has is the aluminum frame, slot for the stylus, and second memory card slot. I see the difference now. But I like Sony because it supports multitude of formats and also with its touch display functionality.